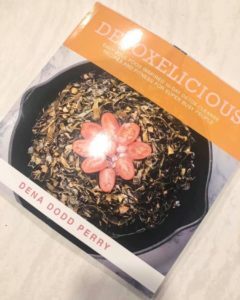 WHAT INSPIRED ME TO WRITE DETOXELICIOUS©, A DETOX FOOD-FITNESS BOOK? This is about self-love, all the way and everyday! First, this detox book is about making plant-based detox foods…delicious. Everyone desires to have more flavor while feeling good about their detox food journey. No yucky food here! Third, I kept getting questions about how to prepare my soul-food inspired, vegan, ribbon-cut collards greens. It became sort of this long drawn out discussion with the checkout person at whole foods. I wanted to no longer hold up the grocery line. It’s finally all here now in living color for anyone to enjoy! WHAT ARE THE ESSENTIAL ELEMENTS OF THIS PLANT-BASED DETOX BOOK? Rolling up my sleeves, I decided that I would take pen to paper and write all of the relevant recipes for 10-days for super busy people — breakfast smoothies, plant-based salads and savory soups!! In summary, this book is for those who would like to press the “healthy reset button” and start over with a healthier lifestyle. Plus, I added very important logic about why certain well-researched MD supplements can bring added cellular value and improve health outcomes. It’s all in this Detoxelicious© Book! WHAT ARE THE SIGNS THAT YOU MAY WANT TO DO A DETOX CLEANSE ALONG WITH READING THIS BOOK? SEE BELOW. Have brain fog more than usual. Experience weight gain around the waistline. Get unexplained headaches and sinus congestion. Feel tired all the time, low libido. WHY IS THIS DETOX BOOK CREDIBLE? I know books are a dime a dozen. Feeling so grateful, my endorsement one-page is written exclusively by female medical doctors. We can’t claim to cure any disease but this detox book gets you on the right track leading to better blood lab results and an improved sense of well-being. Every class is different but this “detoxelicious” journey is worth every sip from the cup, savory mouthful from the spoon and bite from your fork. Enjoy the detox journey with mindful 10-day daily tips, food recipes, yoga fitness and 411 information per detox day! 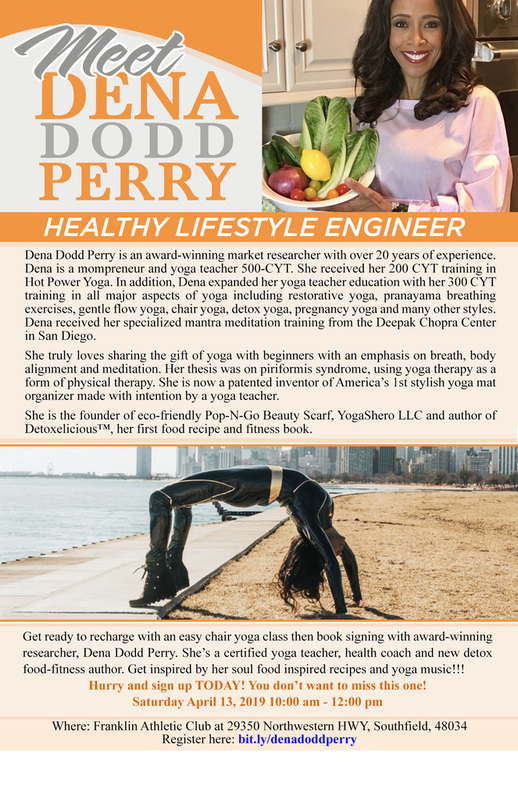 ➡ Sign up for a fun detox yoga class and this exclusive book signing here! Make your detox delicious here. No regrets here! Those that show up, GO!